Richmond homeboy Edgar Allan Poe will get the spotlight this coming Sunday with a couple of very cool works that you may not know about. More than a few composers have found the visceral horror of Poe’s stories to be a source of powerful and evocative music. In André Caplet’s (1878-1925) case, Poe’s Masque of the Red Death gave the composer Conte Fantastique (Fantastic Story), the work that he is most well known for. 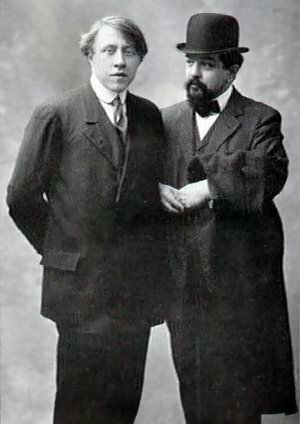 Caplet was a respected contemporary of Debussy’s and Ravel’s, becoming the former’s trusted orchestrator because of his “impeccable judgment” and perfectionism. (He also has the distinction of beating out Ravel in the Prix de Rome in 1901 for his work Myrrha, which depicted impressively “the sudden roaring of the floodwater”). Working on Conte Fantastique, one can see how sorely under appreciated Caplet is today. The piece, scored for string quartet and piano or harp, depicts the narrative events of Poe’s Masque of the Red Death with eerie and poetic harmonies, textures and timbres. Caplet also had a masterful knowledge of how to write for each instrument. The disorienting revelry of dancers and Prince Prospero’s guests is created by whooshing glisses and string flits of tossed off melodies, and their frozen buzz at the haunting apparition of Death by string harmonics and tremolos. Every event in Pie’s tale is chillingly illustrated by the music. To read the story, click here. Conte Fantastique started out as a tone poem, but was published as a quintet after Caplet returned from the war, badly damaged by the poison gas in the trenches of Germany. I see something haunting in this horrid demise, which took Caplet away from us at the young age of 47 before he had a chance to create to his full potential. At least we have his truly “fantastic story”, such a spectral work of great talent, based on the similarly vivid work of another short-lived master, Edgar Allan Poe. Conte Fantastique will be performed with the added bonus of narration, on Sunday, October 23, at 2pm in Herter Hall. Also featured will be a piano work based on Poe’s Alarum Bells, which utilizes rubber super balls and magnetic tape to a thrilling effect. We will be joined by one Garth Newel’s favorite guest artists, the inimitable Aaron Berofsky. There will be no ticket price to this unique concert! Pay what you wish, all are extremely welcome!